There’s a charming photography exhibition on at the moment at Penlee House Gallery called ‘The Marvellous Everyday’ – a celebration of Penzance’s long-standing quirkiness. The black and white photographs, plucked from the museum’s archives, are united by their subtle sense of the surreal. 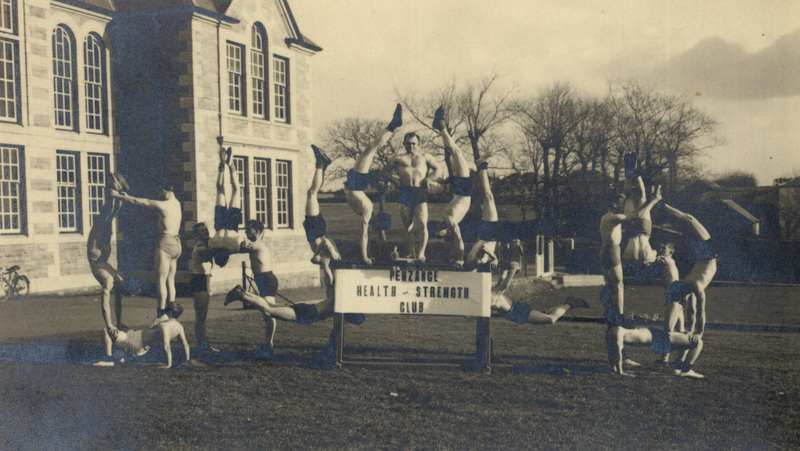 The circus elephants parading along Market Jew Street are likely to stick in the mind, but for me the male gymnasts striking a pose in their mankinis at ‘Penzance Health & Strength Club’ is pretty special (pictured above – it’s worth the click to go full-size, as you can see how much the guys on the left are struggling). PS Where is the health & strength club now? Looks like a nice building – and I could use some health and strength right now. I found this exhibition really fascinating, I think my favourite was the Elephants but also quite liked the looking for the houswife of Britain picture!